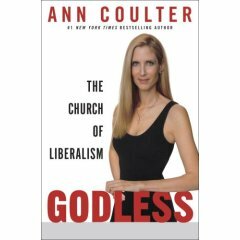 Ann Coulter has got to be one of the stupidest craziest right wing conservative around. She beats people like Sean Hannity, Bill O’Reilly, Rush Limbaugh, Bob Grant and Michael Savage, hollow. Today on one of the morning shows. debating with Matt Lauer, she said some of the most ridiculous things ever heard. While I do agree that the women in question could keep their politics out of the issues…..like the time they campaigned for Kerry, but what Coulter says is off the top of her hat.